March 13, 2019 /3BL Media/ - Business leaders within the Sustainable Brands® community are fast tracking the sustainability agenda. 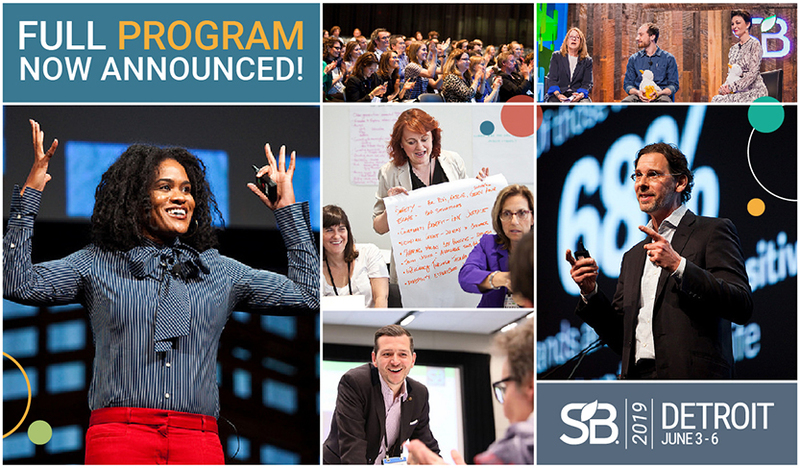 Nearly 3,000 global brand and sustainability executives are gathering at SB’19 Detroit, June 3-6, to learn how advancements in science and technology are disrupting their industries, create uncommon collaborations that foster unique solutions, and discover what consumers are looking for from brands today. An expansive Innovation Expo showcasing 100+ companies that will bring together mission-driven business leaders who have solutions to obstacles facing brands today. Companies holding networking activities and conversations in the Innovation Expo include: BASF, Nestlé, Braskem, Unifi, DTE Energy, Procter & Gamble, EY, Dow and others. Marc Pritchard, Chief Brand Officer, will reveal new insight into how P&G is working to leverage their brands to enable responsible and sustainable consumption practices amongst their consumer base, otherwise known as the intention-to-action gap. Valérie Hernando-Presse, CMO, will share cutting-edge practices and lessons in building authentic purposeful consumer engagement in practice / infusing marketing with purpose and fully embedding sustainability values in marketing. Kristina Kloberdanz, Chief Sustainability Officer, will highlight a new business strategy and unveil products and features that enable more sustainable lifestyles. Ashish Gadnis, Co-Founder & CEO will discuss how we can apply blockchain to create economic identities for people in extreme poverty and other underserved communities. Ryan Black, CEO, will provide share lessons in building an ethical, fair and sustainable supply chain through innovative partnerships that create shared value and delight customers. Dune Ives, Executive Director, will tell the story behind the success of #Strawless and share details about an exciting new campaign against plastic pollution. Dirk Voeste, Vice President of Sustainability Strategy, will explore accelerating superior sustainability performance and launching profitable social-impact businesses. Steven Cahillane, CEO, will discuss embedding purpose into business growth strategy and operating with an eye toward making a real difference for future generations. Mari Copeny will inspire by talking about youth activism and leadership in times of crisis, and share her lessons for brands on collaborating with the next generation. “After three years of studying what The Good Life means to both brands and consumers, through a series of thoughtful conversations and the introduction of new tools, we are creating a one of a kind experience designed to help our customers realize their full potential,” states KoAnn Vikoren Skrzyniarz, Founder of Sustainable Brands. “At SB’19 Detroit, we will lead an honest and open discussion on how science, technology, storytelling and constructive partnerships are helping reshape how brands will succeed in the tumultuous years ahead,” Skrzyniarz said. Sustainable Brands is proud to recognize the many sponsors already committed to showcasing their brand leadership in Detroit, including Presenting Sponsor BASF and Lead Sponsor National Geographic. Additional sponsors include Procter & Gamble, Vinyl Sustainability Council, Caesars Entertainment, Cone Communications a Porter Novelli Company, Braskem, Cox Automotive, Danone, Detroit Convention Bureau, DTE Energy, EY, Kellogg Company, Nestlé, Salterbaxter MSL, UNIFI, The Dow Chemical Company, Alaska Airlines, Keurig Dr Pepper and others. For further information on the conference program, a growing list of confirmed speakers and sponsors or available sponsorship opportunities, please visit the conference website at www.SB19Detroit.com or call (415) 626-2212. Registration is now open and global business leaders with innovative solutions are encouraged to participate. 3,000 global professionals in sustainability, business & brand strategy, product design & innovation, CMOs, and marketing leaders driving business innovation towards a sustainable future. About Sustainable Brands. Sustainable Brands® is the premier global community of brand innovators who are shaping the future of commerce worldwide. Since 2006, our mission has been to inspire, engage and equip today’s business and brand innovators to prosper for the near and long term by leading the way to a better future. Digitally published news articles and issues-focused conversation topics, internationally-known conferences and regional events, a robust e-learning library, and peer-to-peer membership groups all facilitate community engagement throughout the year. For more information visit SustainableBrands.com.